PVI (Prairie View Industries) Single Fold wheelchair ramps are made from lightweight aircraft-grade aluminum and are rated for up to 600 pounds of weight. They are perfect for scooters and wheelchairs when traveling or at home. 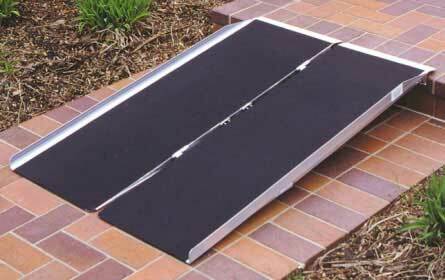 The single fold ramps are 30 inches wide and intended for residential use. Available lengths are from 2' all the way to 8'. Custom ramp widths are available. The Singlefold ramp should be attached to your step with screws or bolts in order to keep the ramp from slipping off. If you need a longer ramp or one with handrails please see the Multi-Fold Wheelchair Ramps or the Modular Ramps with Handrails. Ramps come with a Limited Lifetime Warranty and free shipping.